August 2017: HOT in Florida - - PAGE 419. August 2017: HOT in Florida · · PAGE 419. August 5, 2017: Another hot Saturday in central Florida and some maintenance on my RV-9A. I discovered the winch in the center of the hangar here at ALAS. As you can see I pulled my airplane underneath the hoist and Bill made sure I learned how it works and how to put away the control cable when finished. I hooked to the lift clevis on my engine and pushed the UP button very briefly to get the nose wheel off the floor of the hangar. The main tool today was this fish scale I have had since I first installed the nose wheel in my garage airplane factory. I have also used the scale when loading baggage for a long trip. 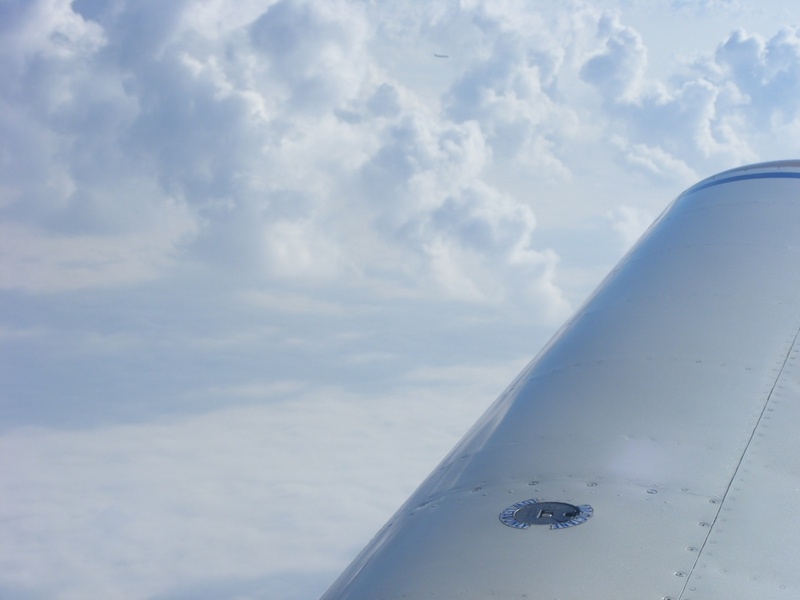 Weight and balance issues can ruin your day in flight or even on the ground. The main purpose of today's maintenance was to check the pressure on the two compression washers that set the amount of force for dampening the rotation of the fork holding the nose wheel. I dug out my RV-9A assembly manual to confirm the amount of pull in pounds for the nose wheel fork at the axle. This photo was taken after I had completed the work and before my lunch break. The grease fitting at the front of the fork was filled to capacity again and after I pushed the fork back and forth with my hands, I measured a 10-pound pulling force while the nose wheel was off the floor. I removed the large cotter pin that holds the large nut in place that compresses the two washers together. I used channel lock pliers to tighten the nut in 60-degree increments of rotation. I tested the pulling force with each rotation which allowed the cotter pin to be reinserted near the bottom of the gear leg. The 21 pounds of desired resistance was obtained after the third adjustment which resulted in 180 degrees rotation of the large nut. 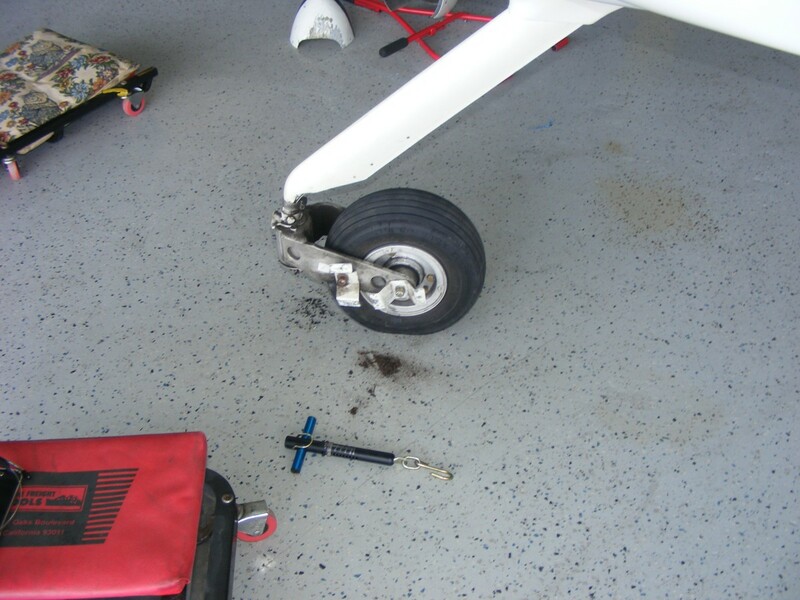 I also removed the nose wheel from the yoke and inspected the nose wheel bearings. They are both still clean and lubricated from the last time I had inspected this assembly. There is a seal that keeps dust out of the bearings. I pushed the airplane back into its current parking place, closed the hangar doors, then went for lunch. When I returned with plenty of ice and water in the red cup, I sat down on the my creeper and took off the front ends of the main wheel fairings to check all the tire pressures. I looked at the amount of tread left on the tires that came with the kit from Van's Aircraft as I have been flying only from paved air strips since October 2012 when I brought the airplane to Florida. I have had 90 takeoff and landings since I departed the grass strip at Folks field on takeoff number 718 in my log book with my current total at 808. My first flight in N2PZ was my takeoff number 368 as on June 9, 2005 from the Collegedale Airport in Tennessee. I moved my airplane to Folks Field on landing number 409 after completing phase 1 testing of the airplane. That means I have made 309 takeoffs and landings in my airplane from Folks Field and other airports before moving the airplane to Florida. 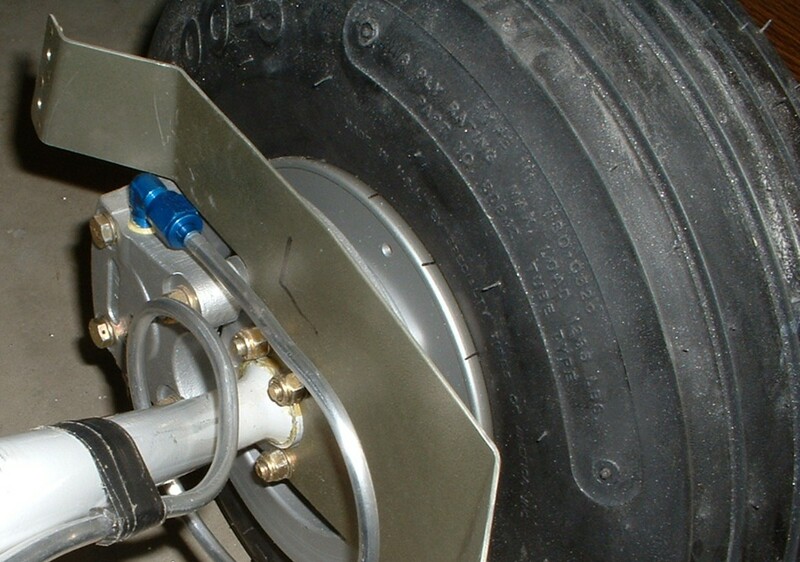 Here is what the tires looked like before the first flights from the Collegedale Airport. This first image was taken in the garage before moving the airplane to Collegedale. The tread depth at new looks like more than 1/8 inch. 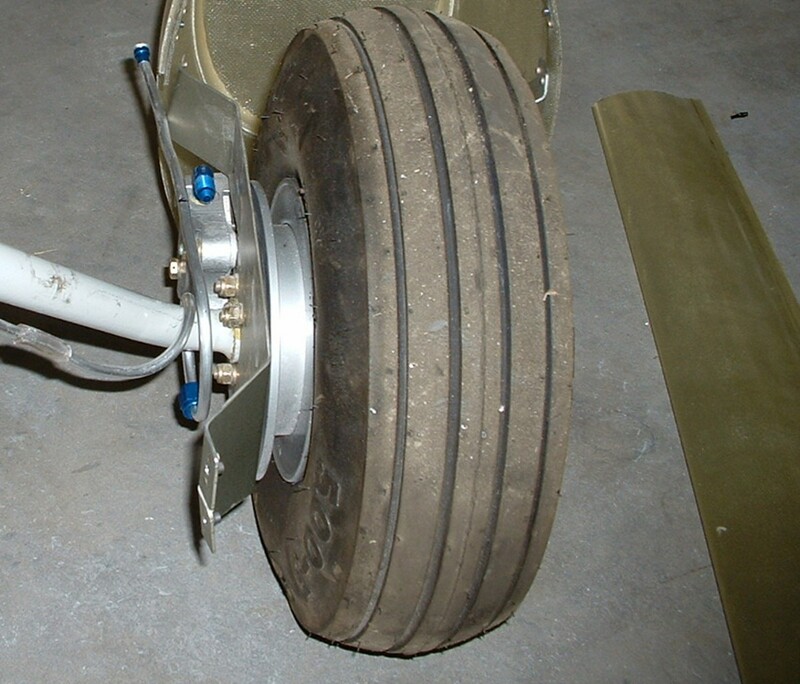 This image shows more dust on the tires at the Collegedale Airport in the weeks before the inspection and first flight. The tires now have less than 1/16 inch tread depth. I looked up the price of new tires from Van's Aircraft for all three tires at $173. I also added a quart of oil to the engine as a preliminary check list item before the big day of the 2017 solar Eclipse. My youngest son had his birthday this past Friday. We talked for a few minutes as he was on board a flight from Miami to Atlanta awaiting take off Friday evening. He mentioned that he has August 21 off with no expected company travels. He said he would like to see the eclipse from the right seat of my airplane. I have already altered my GPS flight plans to stop and pick him up the morning of the eclipse from McCollum Field at Kennesaw, Georgia. 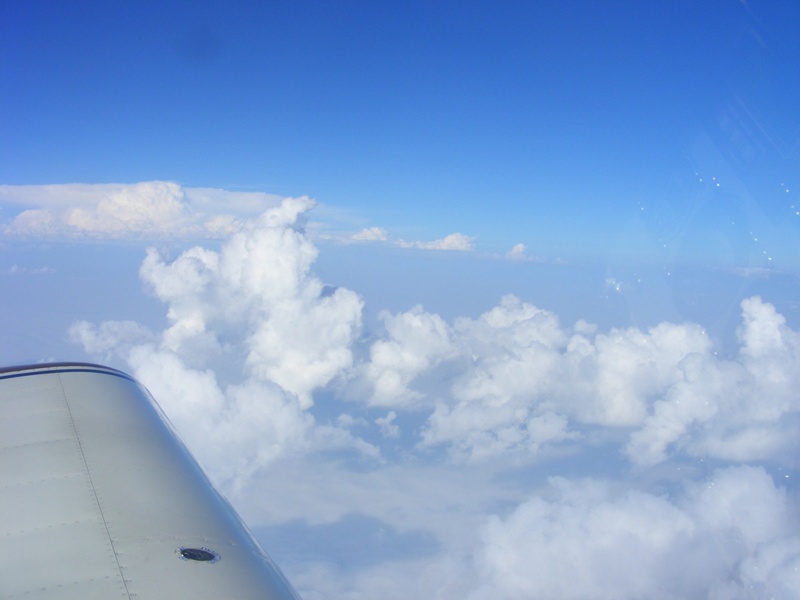 I have prepared GPS flight plans for Tennessee and South Carolina viewing locations in the event the weather is good in one place and not the other. I have already picked out fuel stops and looked at each airport using Google Earth. Now we start watching the 10-day weather forecasts at points along both flight paths. August 19, 2017: Another hot Saturday is in store for today. I was airborne at 7:50 AM as I departed from the Rockledge Airport heading for Folks Field near Chickamauga, Georgia. My airplane was based there from July 2005 to October 2012. I started the trip by making a movie on my digital camcorder using the video from the camera mounted on my instrument panel along with the audio from my airplane intercom. The movie was just to show the area around Rockledge during the departure. 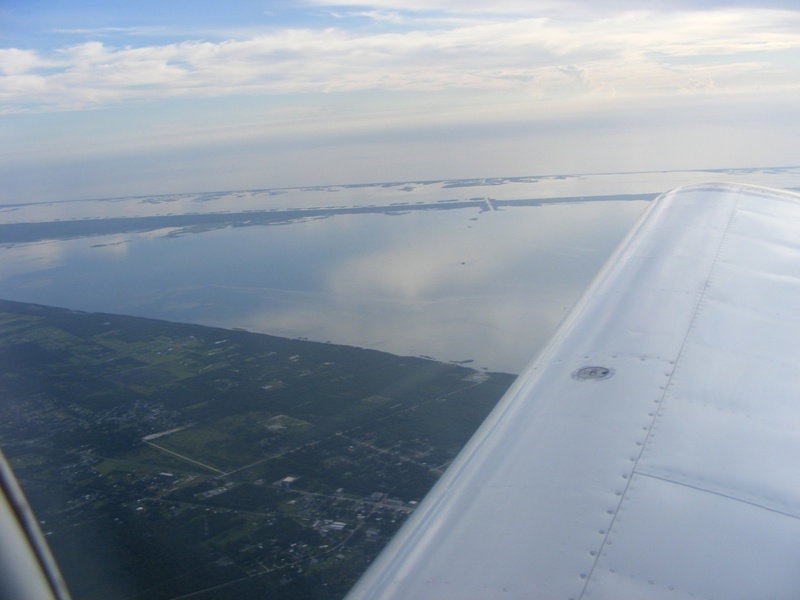 This first image from my snapshot camera at 8:05 AM Eastern Time shows the Indian River lagoon and the Intracoastal Waterway drawbridge on Florida Route 3 north of the Kennedy Space Center. It is restricted airspace, hut anyone can drive on that state highway. My current location is above Mims, Florida at US 1 and Interstate 95. 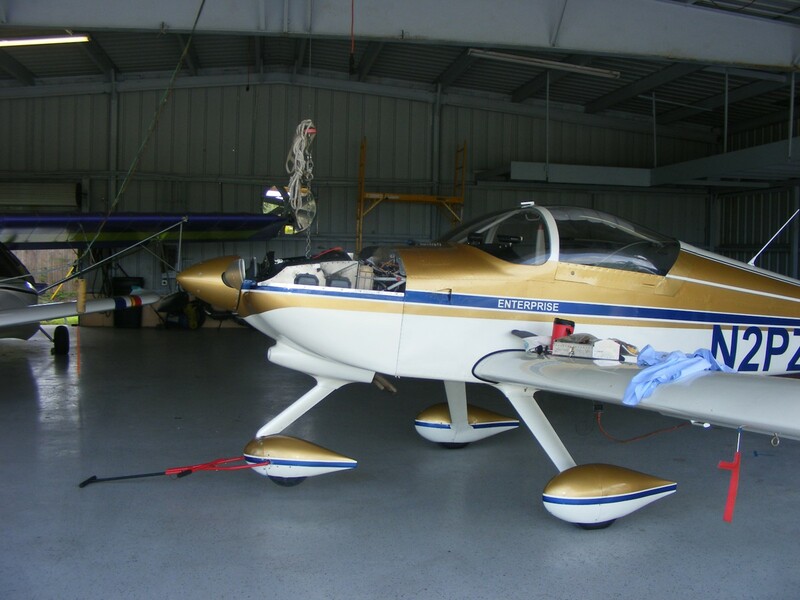 I am climbing up to 10,500 MSL for the ride up the East Coast of Florida heading for Jacksonville, Florida and then on to the Hazlehurst Airport in southeast Georgia for a fuel stop. This image taken at 8:33 AM shows the Oldest City in America: Saint Augustine, Florida with Anastasia State Park just south of the Saint Augustine Inlet at the Atlantic Ocean. 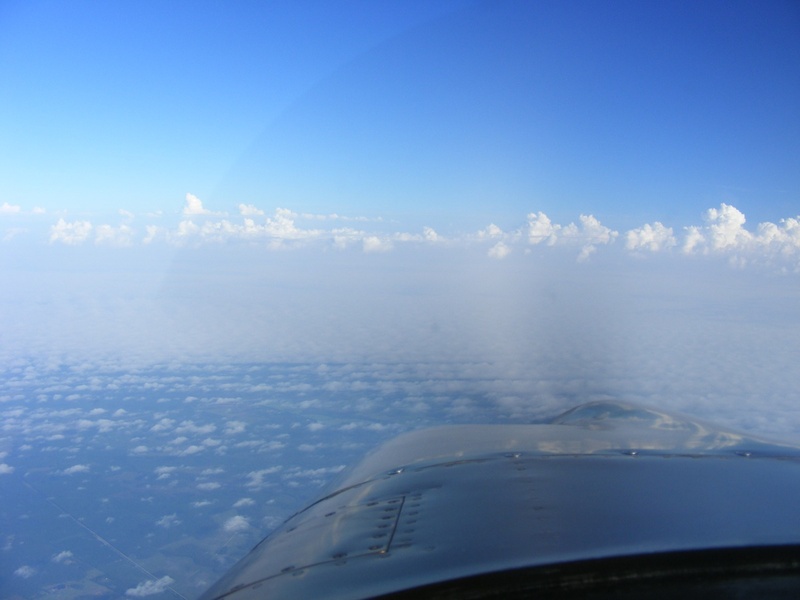 From 10,500 feet MSL at 8:48 AM and cruising at about 180 MPH ground speed with a tail wind helping. 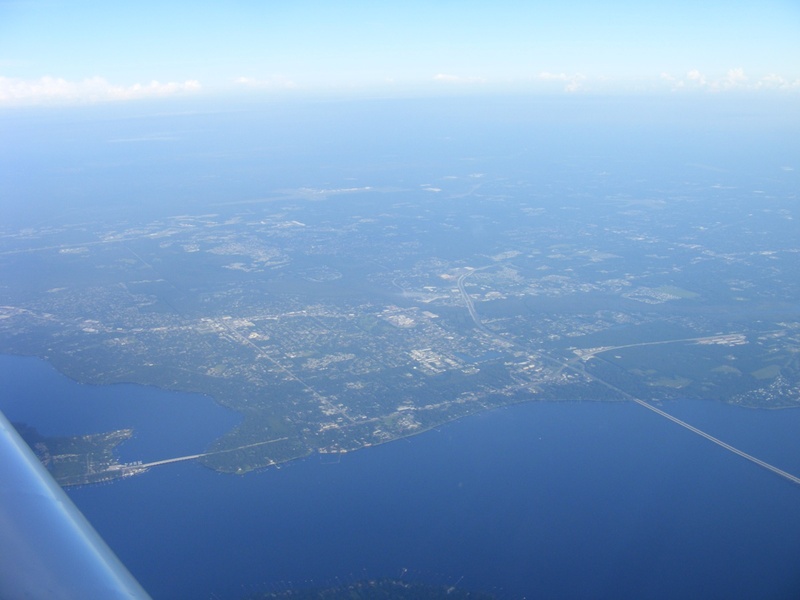 The image below shows the Interstate 295 bridge crossing the Saint John's River just north of Orange Park, Florida. This view is looking west from my flight path. 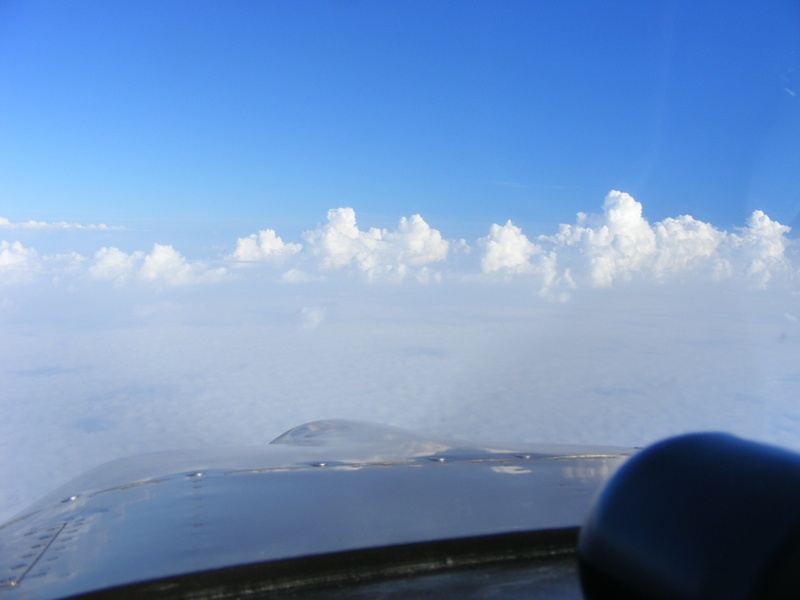 There is a low-level weather front ahead as I pass by the Jacksonville Airport on the west side and well above their Class C airspace. 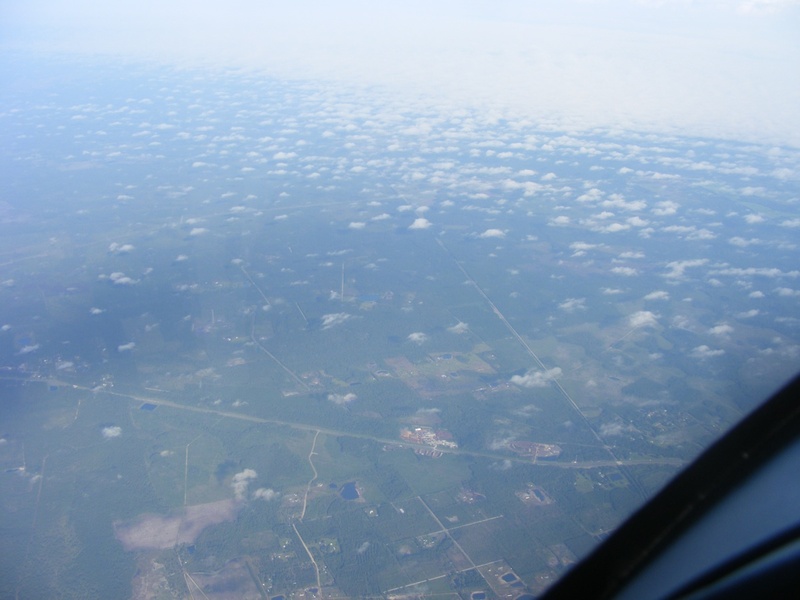 The area below me is still relatively clear of clouds here in the last few miles of north Florida. 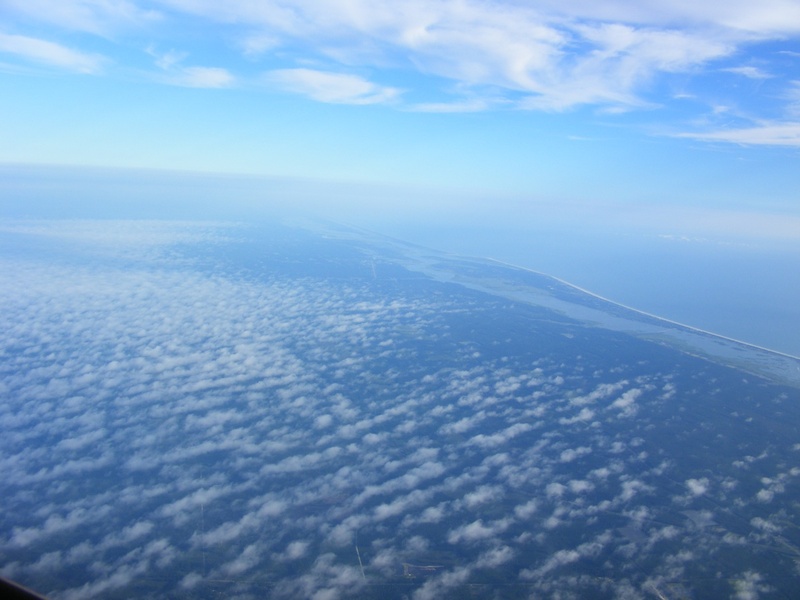 The southern tip of Georgia is hiding in the haze nearby as I pass Callahan, Florida with US highway 1 on the other side of the airplane. How high are those clouds ahead? I am still cruising at 10,500 feet. This photo at 9:04 AM has my position very near JAX Center located in the small town of Hilliard, Florida on US 1. I have my radio tuned to one of their frequencies to monitor other air traffic nearby. A layer of clouds are down near the ground. 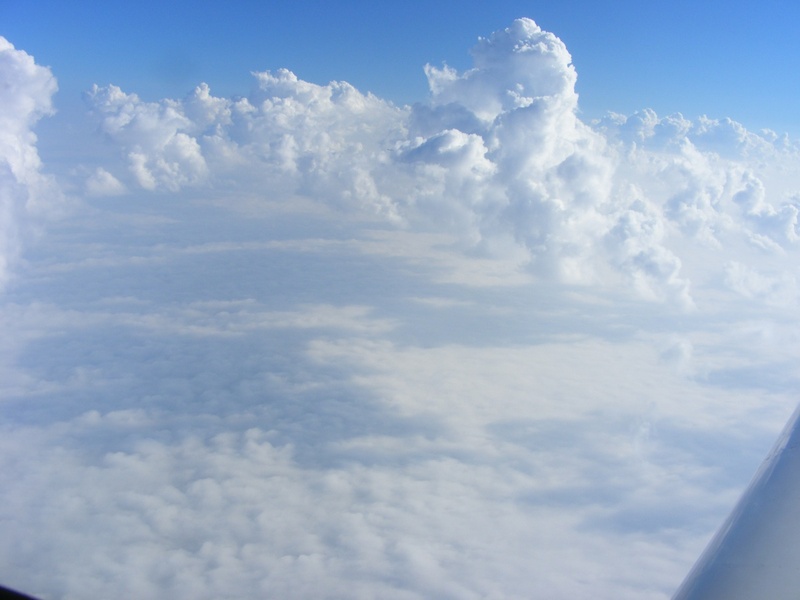 I am selecting a place in the line of clouds where I will not have to climb any higher as I cross that frontal boundary. 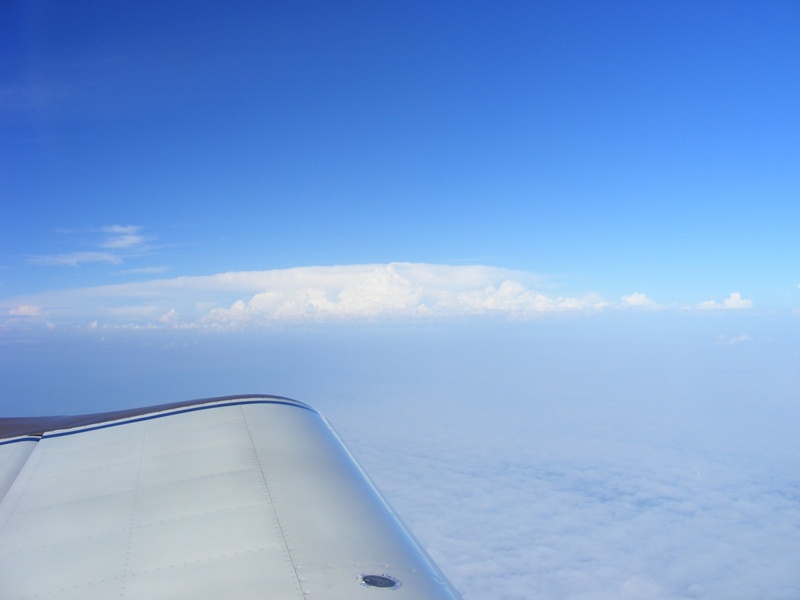 I turned my camera to the west to see what is probably a towering thunderstorm about 100 miles away. My ground speed is around 175 MPH here. I am starting to cross the weather front at 9:07 AM just west of Folkston, Georgia just north of the Saint Mary's River that is the state line between Florida and Georgia in this area. I have plenty of clearance above the line of clouds ahead. Off to my right is an airliner descending toward Jacksonville more than 5 miles to the East and already below my altitude. 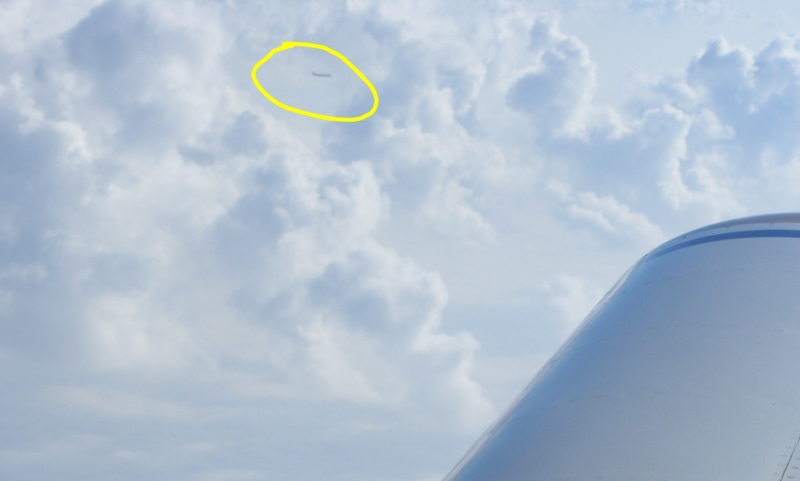 This larger view is cropped from the full-size image above just in case you did not see the airplane.